Beef or Chicken? I Love You Lots. #1 Encounter. Strong Fighting Spirit. EAT THIS KATSUDON! Different Dimension Game Vanves. Felt Anime. The Art for It Hasn't Been Ordered Yet, So No. I Can't Lose to Anyone When It Comes to Smiling. Fortunes. Think About It. Morning Mood. Shooting Game Arc. It Can Cover Up Blood. Okay, I'll Pay You in Advance. This is the List. Do it. It's Happenin', Ain't It?! No, When I Take a Good Look. SWGP2018. T*kimeki Memorial & D*nkey Kong Arc. Let's Pop Together. Spel*nker Arc. Don't Call Me Little Sis! W*nnie the Pooh's H*me Run Derby Arc. Trip Japan. Route 66. 30th Cyber Warfare. POP TEAM COOKING. BOBNEMIMIMMI. Subscribe. Encore. This is Boring. Hater, You're a Good Kid. POP TEAM COOKING. F**k This! The Rising Dragon of Iidabashi - Pipi the Avenger. Eisai haramasukoi! Midnight Dancer. Pop Team Epic Fairy Tales. Dancing with Miracles. JAPON MiGNON. Heaven or Hell? BOBNEMIMIMMI. Latte Art. BOBNEMIMIMMI. Pop Team Cooking. Ginza Hostess Detective. Eisai Haramasukoi. Haunted Mansion. Pop Team Epic Fairy Tales. Science. Pop Team Cooking. JAPON MiGNON. TAKESHOBO. 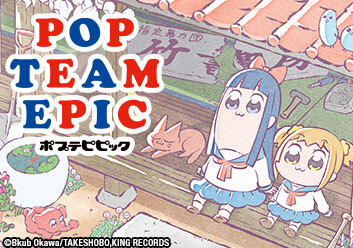 The Age of Pop Team Epic. The Heart's Big Tree. Legend of This Season's Bestseller.